In the era of digitally generated dopamine as stimulant of choice, are we losing the ability to manufacture our own oxytocin? This is a question that has enthralled Jen Jamieson, who greets me in hard yakka overalls lying on a small waiting room couch next to the Carriageworks box office. This and many other questions populate a 20-minute interaction that invites me to consider rebalancing this bonding hormone within my overall biological functioning. Having been temporarily separated from my partner for a month, I am attuned to how I might redress my oxytocin deficiency. We kick off with a clinically orchestrated hug in view of patrons criss-crossing to various Liveworks events. In any theatre foyer, this first act requiring us straddle the tension between accepting intimacy and being offered up for incidental gawking. 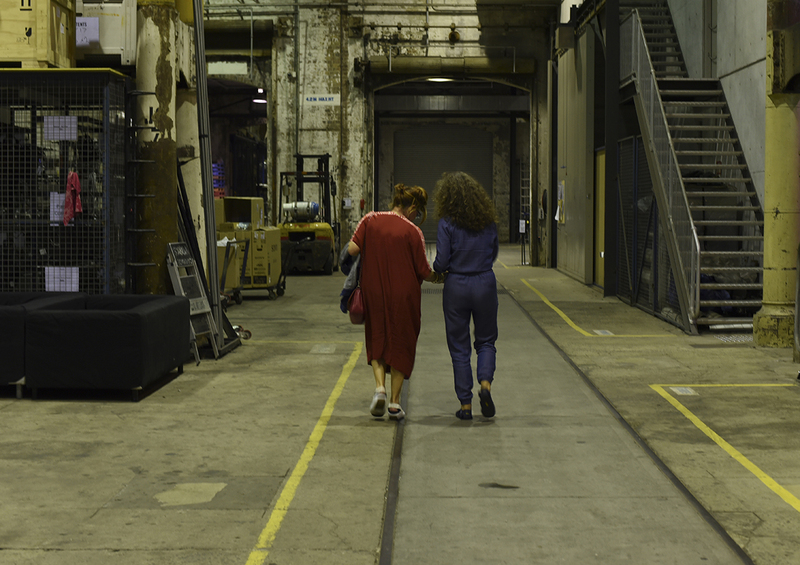 Armed with our first dose of oxytocin, we wander the backstage area like a pair of cells navigating the hidden bloodstream of Carriageworks, while Jamieson foregrounds her obsession with oxytocin from different angles. She asks me to consider the differences in male and female responses to the post-coital release of oxytocin and informs me that synthetically concocted volumes of it are used to strengthen tribal ‘in-group’ morale to aid effective military aggression, but also used in shopping centres to establish a warm emotional link with the act of consumption. Jamieson wears her uber-objective on her denim sleeve to help build resistance to these dehumanising actions. Outdoors, we role-play a shared sense of adventure and, in the process, of building our trust; we pause to literally smell the flowers — a pinch of calming lavender leaves from pots placed strategically around the harsh concrete perimeter. Jamieson signals for us to walk past a metal scaffold structure that reaches a single storey high into the Redfern night sky. She indicates that we would be up there if not for gusty winds threatening the security of some of the props. Instead, I am ushered back into another corridor where a mattress wrapped in silk is installed. We lie side by side, hands held and I stare up into the cavernous space, allowing the shared silence to wash over me as I watch for any feeling of closeness. The rolling of trains punctuates this final meditative embrace. Head rested, I stare in to the distance until “Songs to the Siren” blasts from Jamieson’s phone to bookend the experience. Surely, the feeling of calm that washes over me indicates that oxytocin levels have been raised. Jamieson leads me away from the space and gently informs me that it is time to disconnect and return to my own life, leaving mind, body and heart mildly discombobulated. Jen Jamieson’s heartfelt mission acts like a soothing balm alongside Nat Randall’s marathon of tense gender micro-invalidations in The Second Woman. 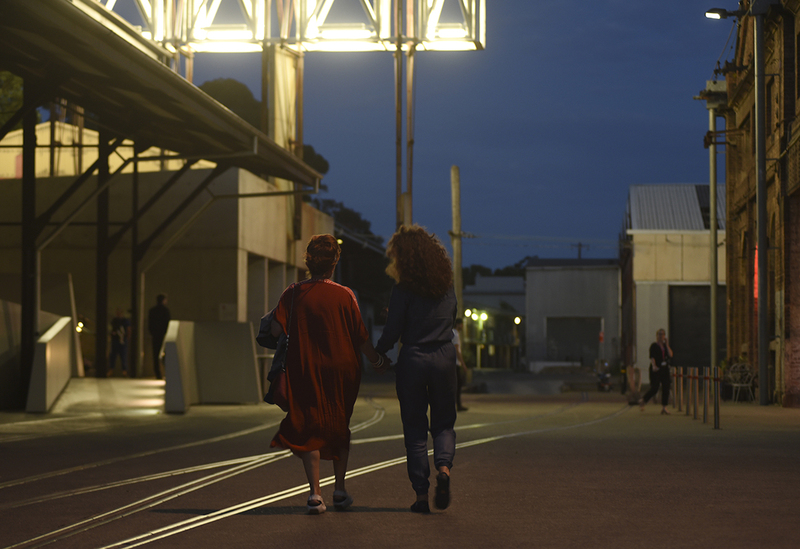 Let’s Make Love is spartan and seeks to unsettle the very forms that it attempts to engage with along the way — interactive biochemistry lecture, guided meditation and mini-date — all unfolding to allow moments of confected intimacy to spread through the concrete box that is Carriageworks. I walk away, still wondering if oxytocin alone can bridge the void we have blown open with our ubiquitous embrace of technology.